Medicaid expansion has been a vital source for health care coverage for Montanans, with a disproportionate number residing in Montana’s rural communities. Proposals to strip people of their health care if they fail to meet strict work and reporting requirements will be especially damaging in rural communities. Nearly half (48 percent) of Medicaid expansion enrollees reside outside of Montana’s seven largest urban areas. 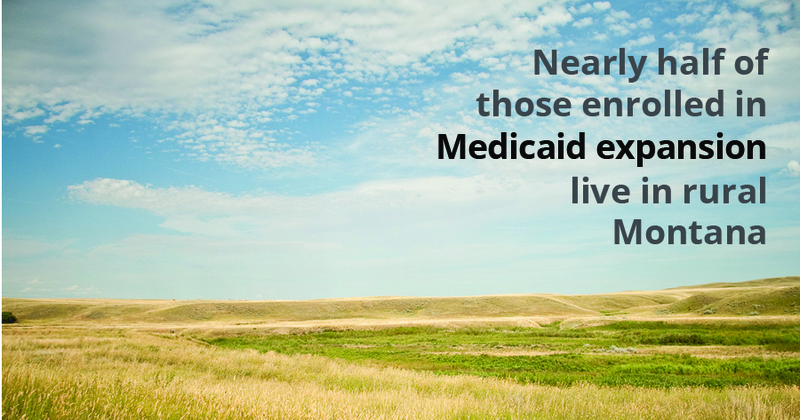 Nationally, one in four non-elderly adults in rural communities have health coverage through Medicaid. Because rural communities face unique economic and health challenges, Medicaid is a vital support for rural communities. Unemployment is higher and incomes are lower in rural communities, and workers are less likely to receive health insurance through their jobs. Prior to the Affordable Care Act (ACA), rural residents also faced higher rates of chronic health conditions, as well as worse physical and mental health than people living in urban areas. Montana rural communities have seen the economic benefits of Medicaid expansion on critical access hospitals and broader local economies. Following Medicaid expansion, health care employment in rural communities began to grow, with approximately 600 new jobs over two years. Rural Montana hospitals also rely on the reimbursement they receive through Medicaid. No rural hospitals have closed since 2015, in part because expansion has been a lifeline for access to health care in rural Montana. If people lose their health coverage, rural hospitals will see their uncompensated care costs increase, making it harder for these hospitals to keep operating, and putting health care for the larger community at risk. Threatening Medicaid recipients with the loss of their health care if they are unable to meet rigid work and reporting requirements will be especially harmful to rural residents. Many rural Montanans living on low-incomes work in jobs like agriculture, manufacturing and retail which do not offer health insurance. These also can have variable schedules, irregular hours, and involuntary part-time work. This means that many working people in rural areas would be at risk of losing their health coverage due to factors beyond their control. Proposals that will kick individuals off health care coverage also pose additional challenges in rural Montana, where individuals often face barriers in accessing public assistance support either in person or online. Many of those subject to harsh requirements in Arkansas have been kicked off of health insurance, as a result of complicated online reporting requirements. Confusion over the new system, a lack of awareness, or difficulty accessing internet caused difficulty in complying with the reporting requirements. In 2017, the Department of Public Health and Human Services closed 19 rural offices of public assistance, making it even more challenging for many families to access assistance. Furthermore, Montana ranks 50th in the nation for access to broadband internet. A lack of internet connection or poor cell coverage could mean working individuals lose their health care coverage if they are unable to report their hours worked on time even if they have worked enough to qualify for coverage. Rural residents also tend to be older, on average, than non-rural residents. Older workers are more likely to face age discrimination and work-limiting health conditions, making it even more difficult to maintain steady employment. The vast majority of Medicaid recipients in Montana who can work, already do work. Two-thirds of all non-elderly adult Medicaid enrollees work. Only one in five live in a household with no worker present. Of those not working in Montana, 37 percent are ill or disabled, 33 percent are caretaking, and 18 percent are attending school. The vast majority of Medicaid recipients in Montana who can work, already do work. Furthermore, Montana put in place a successful workforce support program as part of its bipartisan Medicaid expansion program. Of the roughly 95,000 Montanans who have enrolled in Medicaid through expansion, 25,000 of them have enrolled in workforce training through the Montana Department of Labor and Industry. 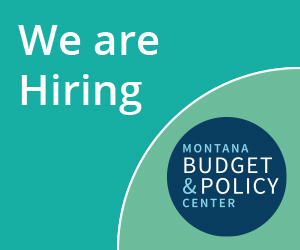 By helping people address their barriers to work, rather than threatening to cut off their health insurance, Montana Medicaid recipients have seen increases in employment and wages. MBPC calculations using “HELP Enrollees by Zip Code,” Department of Public Health and Human Services, January 2019, on file with author. Semega, J., Fontenot, K. and Kollar, M, “Income and Poverty in the United States: 2016,” United States Census Bureau, accessed on Jan. 2019. Ward, B. and Bridge, B, “The Economic Impact of Medicaid Expansion in Montana: Updated Findings,” The Montana Healthcare Foundation and Headwaters Foundation, Jan. 2019. BroadbandNow, “Broadband Service in Montana,” accessed on Dec. 2018. Center on Budget and Policy Priorities, “How Medicaid Work Requirements Will Harm Rural Residents and Communities,” accessed Jan. 2019. Garfield, R., Rudowitz, R., and Damico, A., “Understanding the Intersection of Medicaid and Work,” Henry J. Kaiser Family Foundation, Jan. 5, 2018.